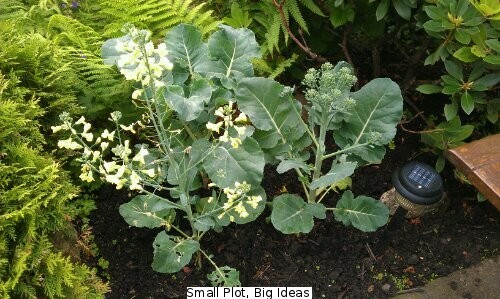 Back in the spring I “inherited” a few pots which contained what were described at the time as broccoli seedlings. There were no plans to grow broccoli as I only had limited space but I’m unable to resist a few seedlings and I was curious to see how they would turn out. Eventually I potted them on when they needed it and then planted them out in the garden. However I have no idea whether they really are broccoli, how/what I should do to encourage them nor is it clear how I can tell when it’s harvest time! At the moment I quite like the dainty yellow flowers but I have a nasty feeling that perhaps they are a bad sign? In reality these seedlings were only planted in some spare flower bed space so it doesn’t matter too much in the grand scheme of things but I’d still like to understand this a little better. As far as I can tell this might be either broccoli or calabrese but none of the online information I’ve read so far tells me when it should be harvested. I think I read somewhere that one of the two is an over-wintering crop while the other isn’t so maybe I’ll just leave them alone for a while and see what happens towards the end of summer. Oh dear… After another quick search around the web just before posting this I think I’ve missed a trick with this broccoli. Oh well, at least the flowers look nice! The time to cut your first `spear` or flower shoot is when they are well formed but the tiny flower buds have not yet opened. Letting them flower will render the spear tasteless. via Growing Broccoli For Best Results – Vegetable Growing Tips and Pictures.